The Soil and Terrain database for the Upper Tana River Catchment (version 1.1) (SOTER_UT_v1.1) at scale 1:250,000 was compiled to support the Green Water Credits (GWC) programme by creating a primary SOTER dataset for a hydrology assessment of the basin. The Kenya Soil Survey of the Kenya Agriculture Research Institute(KARI-KSS) and ISRIC-World Soil Information compiled the SOTER_UT dataset ... according to the standard SOTER methodology. The dataset includes both data of the original KENSOTER database (1:1M) for the Upper Tana Catchment and, new SOTER units and soil profile data taken from other, existing soil surveys mainly at scale 100,000 and from more detailed studies. 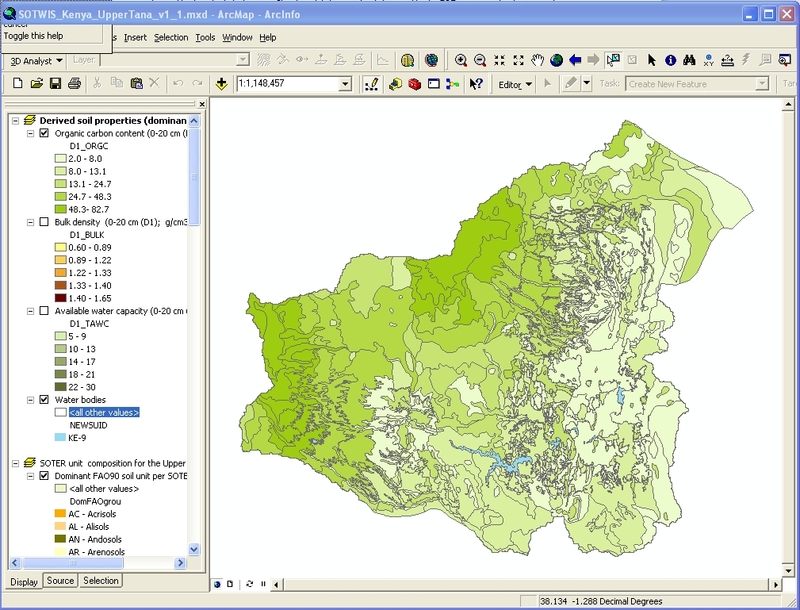 The SOTER database was used for the hydrology assessment of Upper Tana basin using the model Soil and Water Assessment Tool (SWAT)to quantify the impact of land management practices change in the basin's waterbalance. ce32091e-006d-4438-8e03-cf7b4c500df7 Access to the portal Read here the full details and access to the data.